Get hit enough and bad things happen, but the news could have been worse! 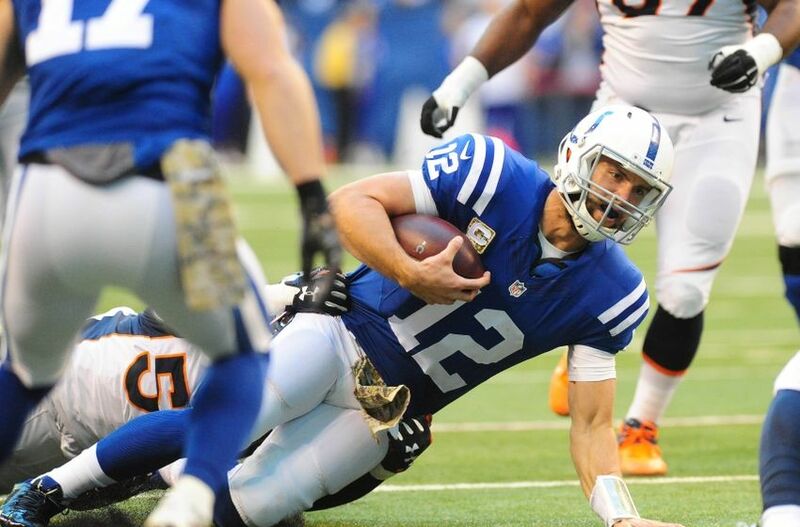 Andrew Luck suffered a lacerated kidney and partially torn abdominal muscle Sunday in a season saving win against the Broncos, and is likely out for a window of at least four games, and possibly the entire regular season. That’s the worst kind of news possible for a team that seemed to find itself against the NFL’s best defense. Well, maybe not the absolute worst news. There are things that could happen to the Colts franchise that would trump Luck’s lacerated kidney, but most are impossible to imagine becoming a reality. 1 – The NFL enacts a rule that a team making an accusation of cheating will be assessed the penalty that could have been assessed to the cheater if evidence doesn’t corroborate allegation. 2 – Trent Richardson has lost 25 pounds by adopting a gluten free diet and has been clocked running a 4.32 40-yard dash. 3 – Back-up quarterback Matt Hasselbeck decides he’s had enough of football – that it’s time to put away childish things. He open a chain of Chipotle restaurants in New England where the chicken is well done. 4 – Realignment sends the Colts to the AFC East and the Miami Dolphins to the AFC South. The Colts go from default favorites to perennial runners-up, and the Dolphins, Texans, Titans, and Jaguars all tie for first (and last) in their first season together in the AFC South with identical 4-12 records. 5 – Luck suddenly realizes that he has been fortunate to only lacerate his kidney as a result of the constant peril he is in behind that offensive line and decides to pull a reverse Brad Stevens career arc by accepting a position in the marketing department at Eli Lilly. 6 – Nuts and bolts from the retractable roof at Lucas Oil Stadium fall on fans every time it’s activated. What? Really? Never mind. 7 – Radio play-by-play voice of the Colts Bob Lamey starts a regimen of medication that takes him to his happy place no matter what happens to the Colts on the field. Radio ratings falter as Colts fans’ curiosity over Lamey’s emotional state plummets. 8 – Colts AFC South rivals Tennessee, Houston, and Jacksonville finally stop dredging bottom of the barrel for coaching candidates and hire Mike Holmgren, Jon Gruden, and Bill Cowher to lead their franchises. 9 – Fellow Stanford alums Coby Fleener, Griff Whalen, and David Parry decide that football isn’t worth their time minus injured teammates Luck and Henry Anderson, and sit out the rest of the season as a display of Cardinal solidarity. 10 – Chuck Pagano reverses course, deciding that iron no longer sharpens iron. He starts whittling in team meetings and media availabilities to show that iron really sharpens and shapes wood, develops a Ron Swanson-esque obsession with woodworking, and quits football to open a handmade furniture store in Cicero. This entry was posted in Featured Story, Indianapolis Colts, Kent Sterling, NFL and tagged Andrew Luck kidney, Chuck Pagano, Coby Fleener, Colts injuries, Colts Stanford, Matt Hasselbeck, Trent Richardson on November 11, 2015 by Kent Sterling. Jim Irsay extends Ryan Grigson’s contract for another five years.